World Nomads is best known for insuring young Kiwis going on a gap year trip. They’re recommended by The Lonely Planet and National Geographic, and they market themselves for young, adventurous backpackers. Even though the focus is on younger travelers, World Nomads does insure New Zealand residents under the age of 70. World Nomads (also known as Worldnomads or nomads insurance to many New Zealanders) is one of the biggest names in travel insurance. They cover people from over 150 countries, and have a reputation for hassle free claims and the ability buy or extend your policy out of country. In this World Nomads and Lonely Planet travel insurance review, we give you both the good and bad, and look at the plans they offer, and talk discounts. WNJAN15 – it gave us a 7% discount. Not bad! Tip: It seems that World Nomads changes this code regularly. So, if WNJAN15 doesn’t work for you, try substituting the current month and year, e.g., WNMAR15. Also try the previous month! When we successfully used the WNJAN15 code, it was mid-February! Enter your information (age, travel dates, country of origin and where you’re travelling) on the first page. Click Apply Code. Your new price, with the discount, is shown. Tip! You MUST click the Apply Code button. If you just click Buy, your discount won’t appear. You can buy, extend and claim online. No need to hassle with phone calls or faxes. 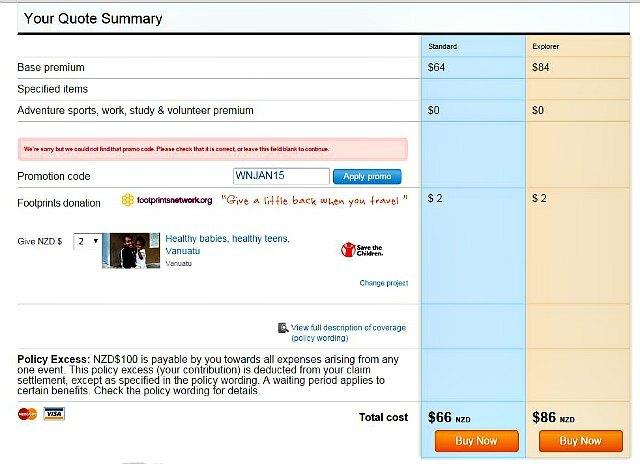 You can buy worldnomads.com travel insurance travel insurance after you’ve already left New Zealand. Most travel insurance companies require that you buy insurance before you leave on your trip, so this is perfect if you’ve left already and forgotten to buy travel insurance. World Nomads doesn’t offer travel insurance for anyone age 70 or older. World Nomads offers two packages, both with a $100 excess. How much does World Nomads insurance cost? All the following prices were for 2 weeks and are here solely to give you an example of typical costs. 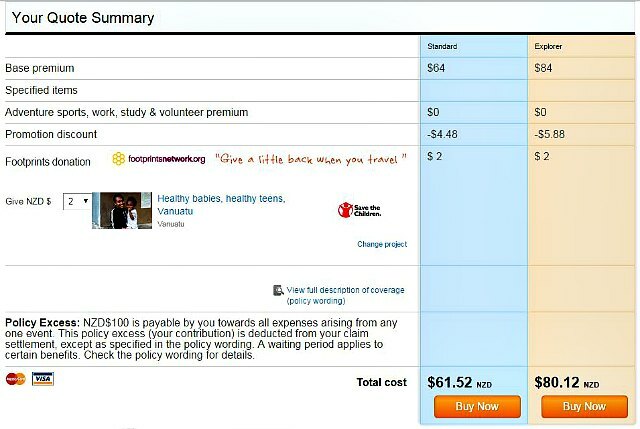 For a single person under the age of 70, we were quoted $66 (before discount) for the Standard policy, and $86 (before discount) for the Explorer policy. For a couple, we were quoted $123.60 (before discount) for the Standard policy, and $161.60 (before discount) for the Explorer policy, making it a bit cheaper to travel with a partner. For a family, we were quoted $130 (before discount) for the Standard policy, and $170 (before discount) for the Explorer policy, making a family policy the best deal of all. How does World Nomads define a family? One or two travellers, 69 years old or younger, with up to 8 dependents 20 years old or younger, all New Zealanders and travelling together for over 50% of the trip. One of the travelling adults must be the legal guardian of the dependent(s). Note: The above quotes were for travel to Australia, but the cost of your policy may be different if you travel to a different region. World Nomads offers different prices and policies depending on numerous factors. If you’re under age 70, World Nomads is one of the most competitively priced travel insurance companies out there.